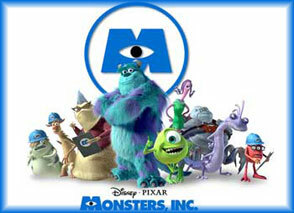 Disney Pixar follow up to Toy Story: Monsters Inc. In a land of monsters, James P. Sullivan is king. He and his coworker/ friend Mike Wazowski are two of many monsters that work for Monsters Inc. a utility company that generates power for a very paranoid and nervous city of monsters. This power, oddly enough, is generated from the screams of children, which is produced by scaring them in their sleep. One night, however, Sully uncovers a devious plot to rid Monster city of it's power problems, but in all the wrong ways. Together, ironically, Sully and Mike will fight to protect the innocence of the children they scare every night.